Patriots defensive ingenuity leads to a pair of interior lineman leading the league in a key pass rush stat by a wide margin. With 18 total pressures, Trey Flowers led all defensive lineman when rushing the quarterback from 0-technique – at just 270 pounds. Flowers converted 44.4 percent of his pressures into QB hits or sacks, first in the NFL from 0-tech. Flowers’ pass-rush productivity of 11.6 from 0-tech was second in the league with at least 60 pass-rush snaps. 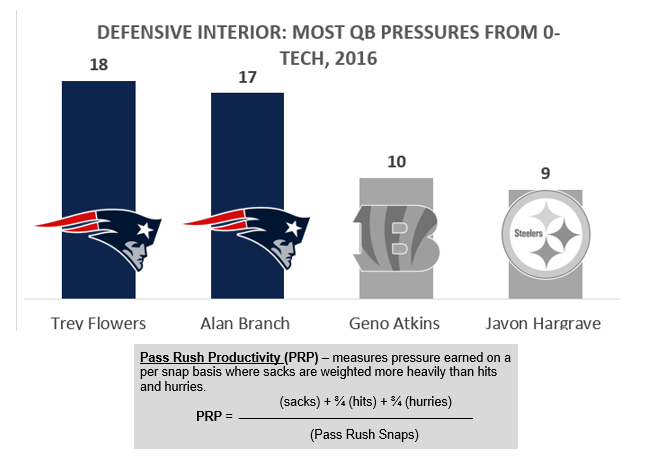 Alan Branch was second in the league with 17 total pressures from 0-technique; the next-closest player had just 10.